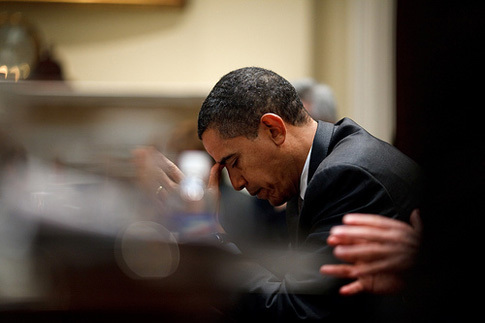 President Barack Obama reflects during a budget meeting in the Roosevelt Room. Official White House Photo by Pete Souza. The Obama Administration appears increasingly poised to move forward on comprehensive immigration reform, as promised. Yesterday the White House announced budgetary initiatives that signal a change in priorities and pave the way for immigration reform. At the same time, Secretary of Homeland Security Janet Napolitano, testified before the Senate yesterday about her plans to protect our borders and enforce our immigration laws in smarter and more effective ways. While the changes are welcome, they’re still just fiddling along the edges of a real solution. Comprehensive immigration reform is the only real way to fix the problem. President Obama unveiled a $27 billion budget plan for border and transportation security. The budget also includes increased funding for interior enforcement, including a 30% increase for the problematic Secure Communities Program, which is meant to identify dangerous criminals in U.S. jails but currently appears to be directing resources at run-of-the-mill undocumented immigrants as well. And, of course, there are increased funds for workplace enforcement, putting more weight behind the new worksite enforcement priorities announced earlier this week. The controversial and error-ridden E-Verify program is set to receive $112 million to be spent on monitoring and compliance, and on improvements to the data – welcome changes, but still not enough to make a mandatory program acceptable. Overall, the changes are meant to emphasize new enforcement priorities, achieve maximum effectiveness, and conduct immigration enforcement in a manner that is consistent with American values. The President’s budget also recognized a need to invest in application processing and immigrant integration. The 2010 budget includes increased funding to reduce exorbitant application fees and improve processing of immigration applications. The budget will also allow for the creation of an immigrant-integration office at U.S. Citizen and Immigration Services and provide grants to community groups that help immigrants prepare for citizenship tests and learn English. Additional funding will create jobs for 28 new immigration judges, an important first step in dealing with the long neglected backlog of pending immigration cases. Immigrant advocates have noted that these are important steps toward improving our immigration infrastructure, making enforcement more effective, and integrating newcomers into our communities. However, throwing more money at the current system is still not a solution. In order to truly move our immigration system into the 21st century and make it consistent with American values, the Administration and Congress must take the next logical step and pass a comprehensive immigration reform that includes a legalization program for the approximately 12 million undocumented immigrants already residing in the U.S. Reform has been attempted before and has crashed and burned, and spending more on enforcement has long been the back-up plan. This time, let’s hope that spending more money wisely is not an expensive band-aid, but the first of many steps toward true reform.